Grape Ape. Purple Haze. Granddaddy Purple. While all these delicious cannabis strains are tasty and intoxicating, they’re best known for their distinctive vibrant purple hues. In case you weren’t aware, weed is usually green. I remember my dealer telling me about purple weed for the first time waaaaay back in the ’90s and thinking to myself, “This lady is high on more than pot.” But sure enough, when a few nugs were tapped out from a film canister, they were as purple as Prince’s guitar. They were also very stinky, and we got very stoned when we smoked it. I immediately locked the color and scent together in my mind with the great high. 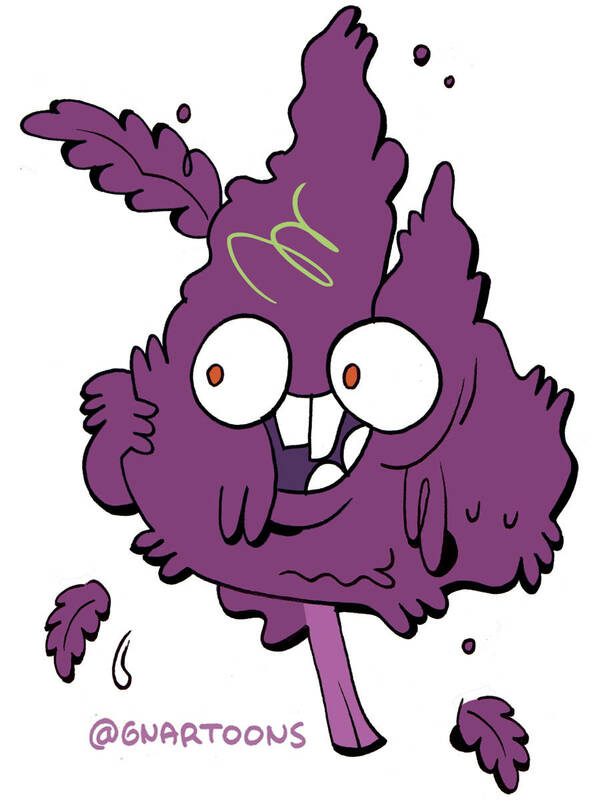 Purple leaves became a notorious trait I would shell out extra bucks to obtain, their rarity ensuring their popularity. But what makes weed purple? And is it always a stronger high? Over the years, growers have traded in a variety of tales about how to produce purple buds. Many rumors revolve around changing the plants’ food, water, or light cycles. But most growers these days insist that you’ll do more harm to a plant than good in the pursuit of purple, and that any change in the color produced through these methods is because the plant is not healthy. The colors of cannabis are created by chemicals called flavonoids. The word comes from the Latin flavus, which means yellow. Despite how the word sounds, flavonoids affect how a plant looks, not tastes. There are over 6,000 known flavonoids. Chlorophyll is one, and it creates the green found in plants. Purple is determined by the flavonoid anthocyanin. Other colors come from other flavonoids. Because chlorophyll is also key to plants turning sunlight into food, they tend to max out on that color. But as the year moves along and temperatures change, chlorophyll begins to break down. That’s when other flavonoids become visible. Think of how leaves change color in fall: If there’s an abundance of anthocyanin, the plant will turn purple. Growers looking to produce purple nugs need to start with strains with a natural propensity to produce anthocyanins, or their plants will not turn purple, no matter what methods they use to induce a color change. Genetics determines if a strain is likely to have a higher percentage of anthocyanin. Strains with more anthocyanin actually tend to have lower amounts of THC, so modern strains that are purple and super-stoney are often hybrids or have been coaxed into developing more THC. Other than making plants look really cool, anthocyanins are also known for having serious health benefits. They are potent antioxidants and offer impressive analgesic, anti-inflammatory, and neuroprotective properties. Anthocyanins are found in fruits and veggies all over the world. They are even what gives the blood orange its “blood.” But the chemical is in especially high concentrations in berries of all kinds: raspberries, goji berries, cranberries, blueberries, etc. Diets high in foods containing anthocyanins are correlated with a reduction in chronic lifestyle diseases and increase in general health. While no studies have been done on the health benefits of anthocyanins in cannabis, it’s possible that edibles made with purple strains could also possess these same benefits.